Intended use: Everyday road running, medium pace long distance. 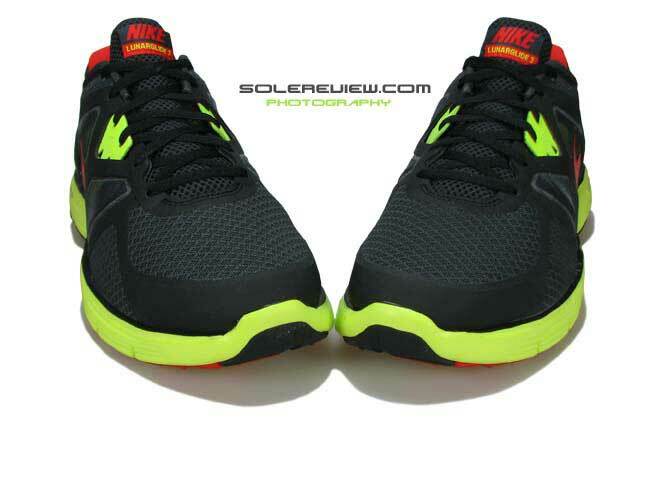 Upper: Mesh, microfiber, internal bootie, midfoot straps, TPU heel support. 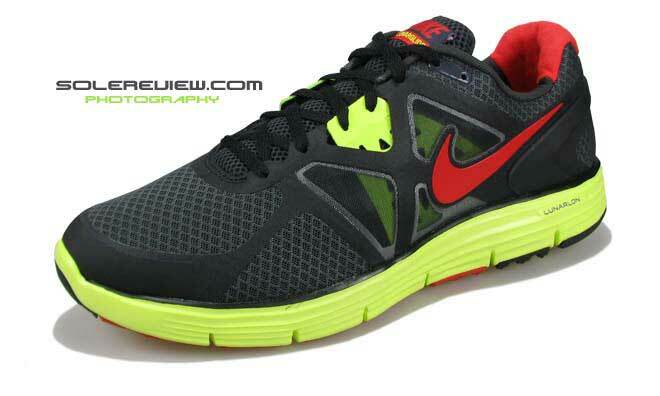 The third version of the Lunarglide series comes updated with better fit and cushioning. Continues to remain an extremely versatile shoe for runners regardless of foot types. When we reviewed the original Nike Lunarglide+ in late 2009, Nike was starting to switch many of its running shoes to the new Lunar foam platform. 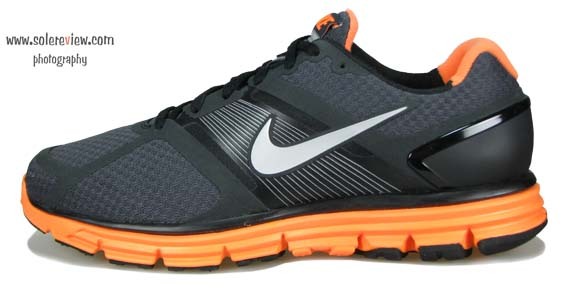 The 2009 Lunarglide, we felt, was a great shoe – it mixed support, cushioning and the overall ride quite well; and it did go on to become one of Nike’s best sellers. 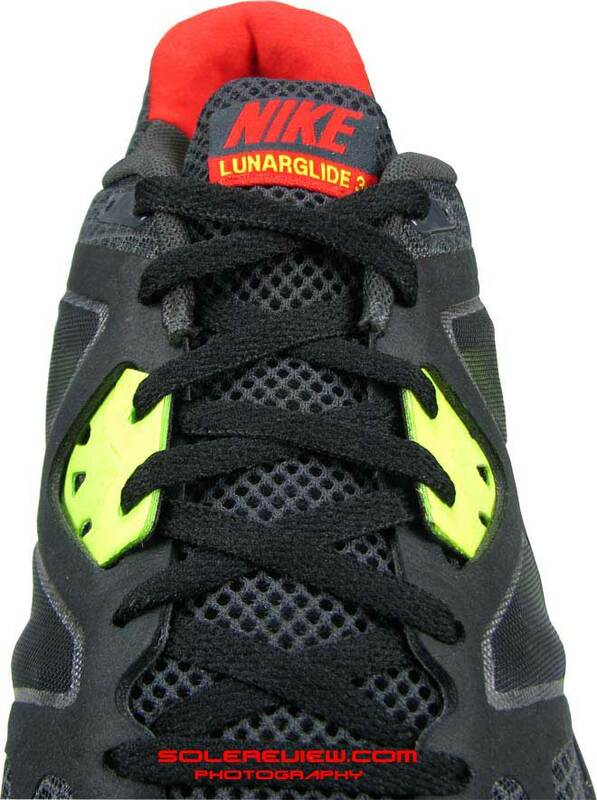 Lunarglide+ 2 followed in 2010; we did not review the shoe, but from what we saw, the 2nd version was based on the same sole platform with minor changes in upper design. So when the all new 2011 Nike Lunarglide+ 3 intro’ed recently, the inevitable question came up – how much better is this shoe than the first? 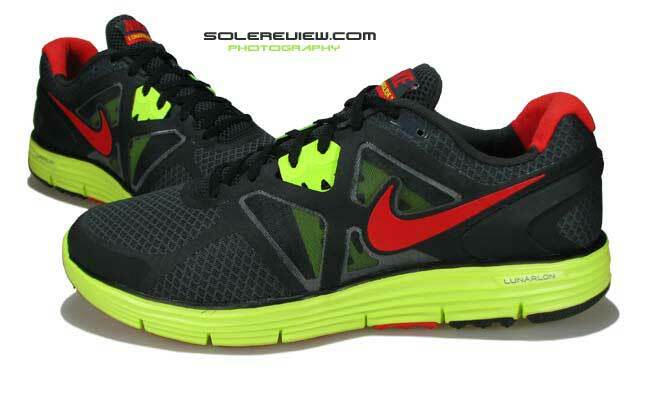 The 2009 Lunarglide was a very competent shoe. It had all the right ingredients, be it the use of the fly-wire panels and no sew technology on the supportive upper, or the new beveled Lunarfoam insert encapsulated in an injection molded EVA midsole. The result was a shoe which had great ride, without feeling too spongy or too hard. A spot which the Nike Pegasus held for a long time. Nike’s mantra for the Lunar range of product line was “dynamic support”, a versatile concept which targeted runners with varying foot types and arch heights. The wedged Lunarfoam insert is supposed to provide pronation control for runners with low foot arches (this works by using a combination of a soft and hard foam at interlocking angle, like a wedge), while at the same time it was cushioned enough for runners with regular or high arches to run in. I have a regular arch so I cannot comment on how it works for flat footed runners, but it certainly did work for me! 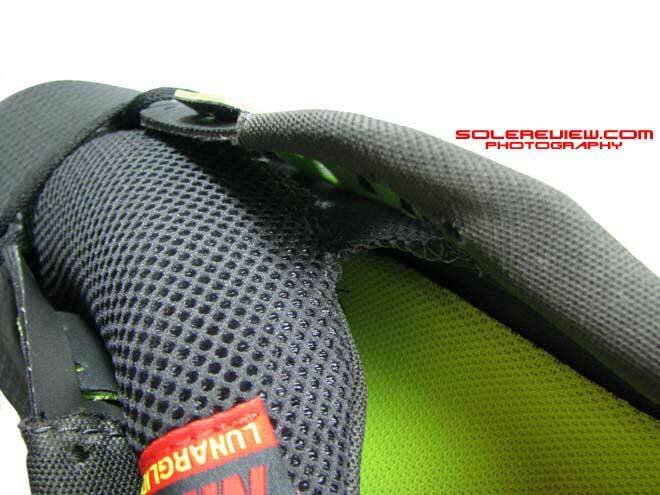 The upper scored a few brownie points due to its use of seamless no sew construction, while the midfoot(near the swoosh logo) flywire panels with its Vectran fibres held the foot firmly in the place. Going by what we see in Nike’s current running lineup, the 2009 Lunarglide was one of the early adopters of Nike’s minimalism trend – a design direction which sought to strip away multiple layers of leather from the upper, and replace that with a few no-sew synthetic leather panels. Economy of aesthetics, if we had to put it in words. 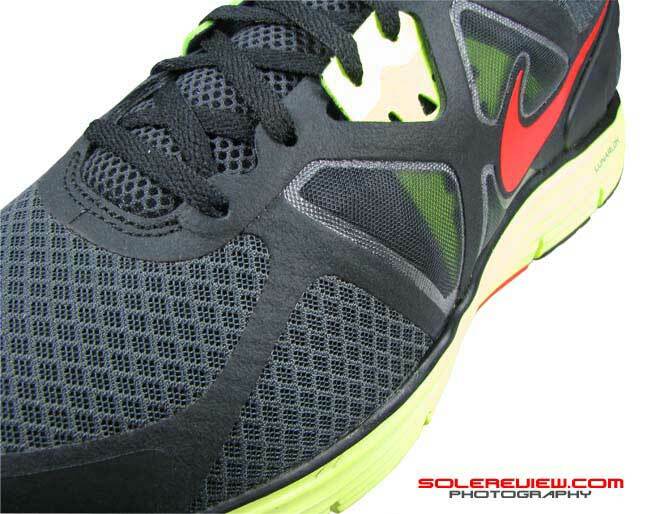 First impressions: the 2011 Nike Lunarglide+ 3. 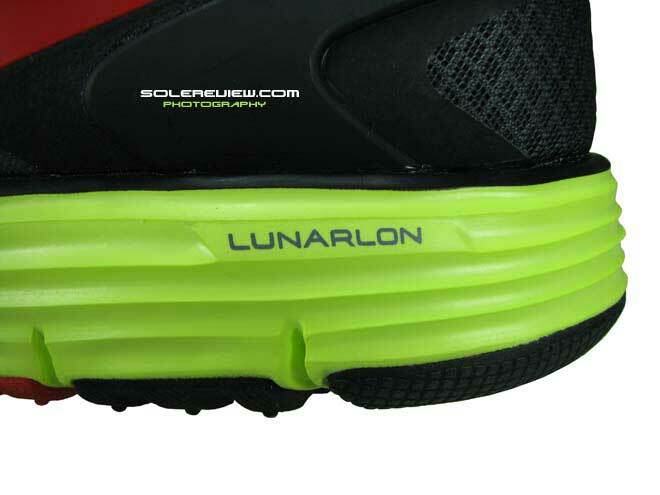 As with all sequels, footwear or Hollywood regardless, we had great expectations about the 2011 Lunarglide+ 3. So when I got a freshly boxed pair from our friends at Nike, I couldn’t wait to review them! I opened the shoe box, revealing a pristine pair of Nike Lunarglide 3. The first thing which I noticed was the absence of the Flywire panels in the midfoot, being replaced by an internal strap which attached to the lacing system and seemed to work independently of the upper. The new midfoot straps are very effective. The straps are not part of the upper, so when you pull the laces up firmly, the shoe wraps around your midfoot, hugging it from both the sides. This is evident even when you are just lacing them up – and the new insole design incorporates ridges along the length of the insole which allows it to cup the soles of your feet (see pictures below). 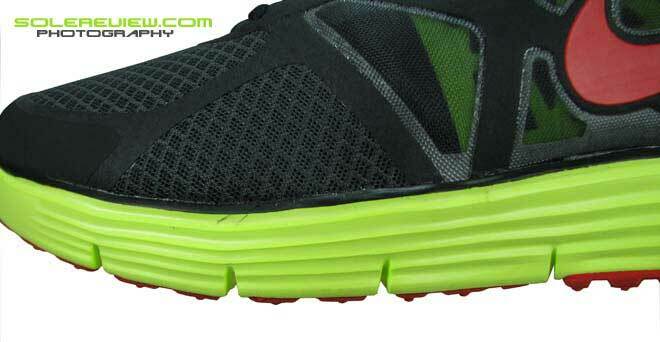 The Lunarglide 3 has an inner sleeve (gusset) which prevents the tongue from moving around; this feature made its debut in the Lunarglide 2 and has been carried over to the third version. This, when combined with the new midfoot strap system, results in a custom fit far superior than the original 2009 Lunarglide, or its successor, the Lunarglide 2. And when I put the initial miles on it, the custom fit kept the foot secure while in motion, almost felt like a milder version of an arch compression band. A nice feeling to have when you’re soaking up some miles on road! The independent midfoot strap as seen from inside. Interesting that the inner side of the strap has ribstop texture, while the outside has a nubuck like finish. I can guess this was intentionally done to have the strap blend in with rest of the upper aesthetics. The strap is also perforated for ventilation. 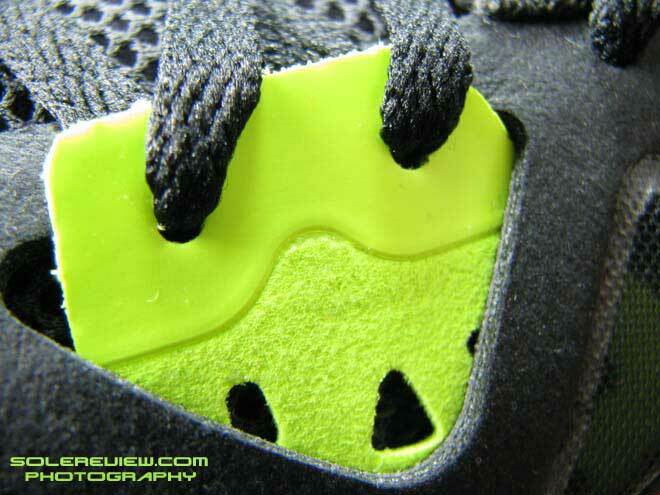 Zoom shot of the midfoot strap. 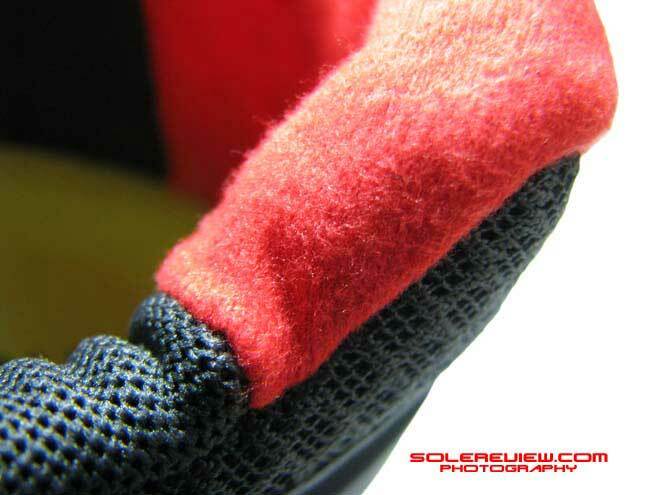 The fibrous Nubuck texture visible on the outside. The tip of the strap is reinforced with a transparent laminate to prevent tearoff’s. The inner tip is reinforced too, have a look at the picture above this one. Ventilated air mesh under the fused swoosh logo. The two pictures above show the inner sleeve or the gusset which attaches the tongue to the upper. That explains the missing laceloops! Among other improvements, the top bumper gets reinforced, the midfoot area gets better ventilation and the heel counter undergoes weight loss surgery. While the 2009 Lunarglide had exposed mesh around the toe area, the Lunarglide 3 uses a couple of laminated layers in the too area to prevent the shoe getting damaged by unexpected nicks and bumps while running. 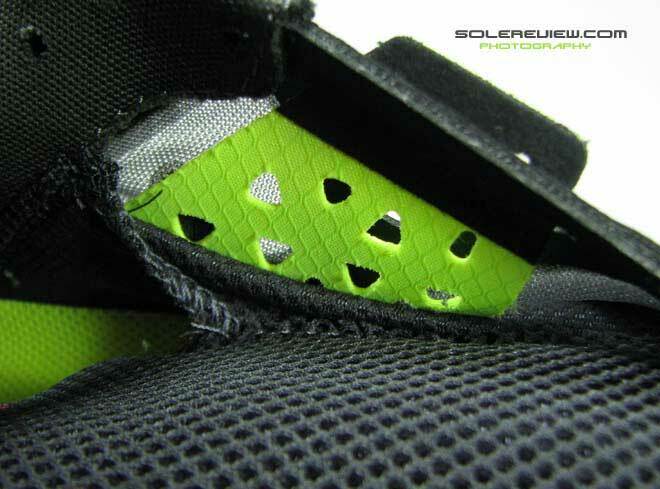 The midfoot area loses Flywire, but instead gets air mesh and perforated midfoot strap which aids ventilation. Lastly the heel counter cuts down on a lot of unnecessary weight by reducing the amount of hard plastic (TPU) and using mesh instead. 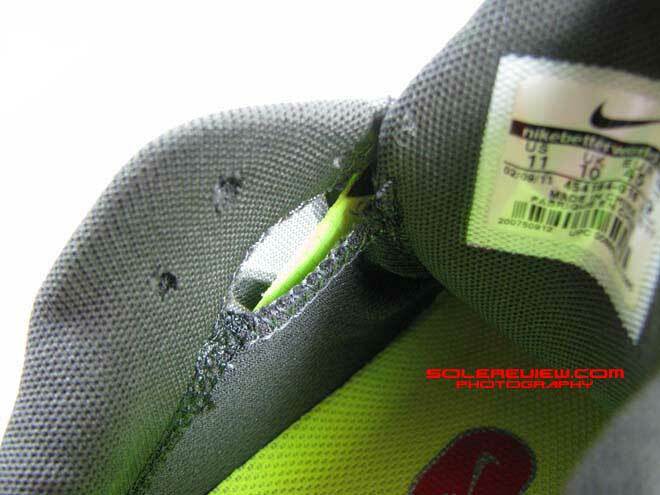 This has led to an increase in heel area ventilation – a rare commodity since most of the running shoes(Nike included) uses either a plastic heel cup or an internal heel counter, hence blocking airflow. There are some more minor tweaks as well. The collar area continues to use two different types of lining material; the grey mesh combined with the softer microfiber fabric around the Achilles area. During my 4k test run, I found this new fabric more comfortable than the one used before (Polyester Terry) and it holds on pretty snugly too. 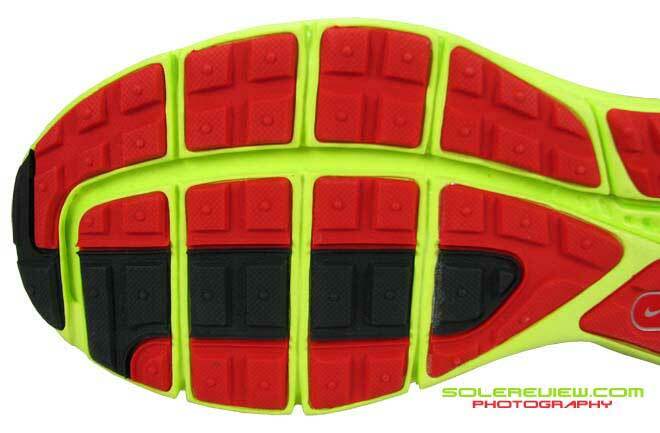 The volt insole looks the same aesthetically, but the reverse has ridges built along the length of the feet. Things like these come at a slightly incremental cost to manufacture, so I assume that these were built in to provide torsional rigidity to the foot to prevent twisting the arch, but I yet have to assess its efficacy. I need to test out the shoe a few more times, maybe with a regular insole popped in, and then will be back with an update on how the difference feels. From a design perspective, the Lunarglide 3 carries over the same aesthetic feel from its original version. The upper retains a similar look and feel, while some cosmetic updates can be seen in the midsole; the lines look much cleaner and the outsole geometry undergoes a modification too. The layout of the rubber parts is more conventional, and the average size of the Nike waffle lugs gets larger. 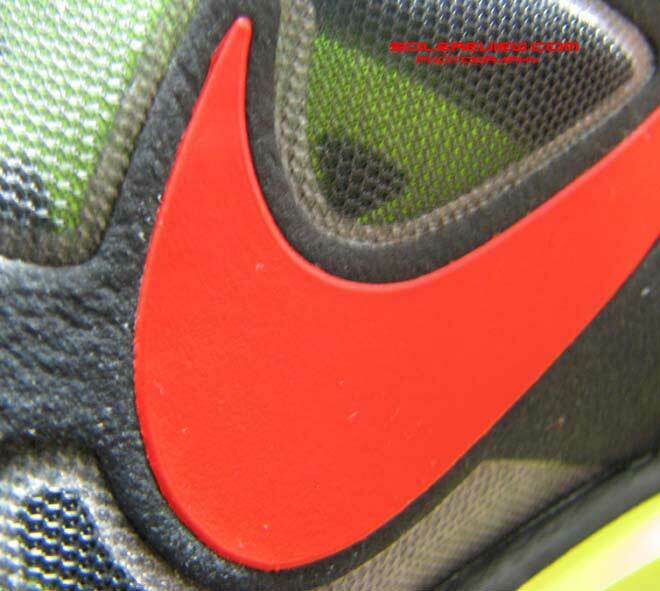 The TPU (plastic) midfoot shank is gone, but the flex grooves are retained along the length of the midsole.”Dynamic support” and “Lunarlon” callouts are prominently displayed on the sides, something which has carried over from the previous versions of the Lunarglide. 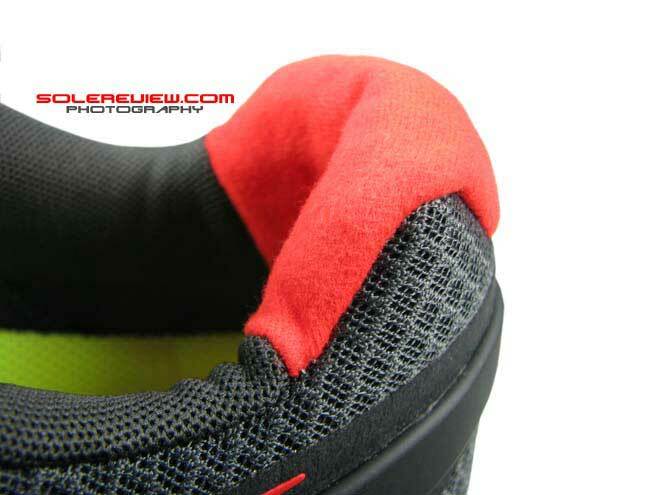 The collar area uses dual materials – the red portion which wraps the Achilles is made of soft and snug microfiber. 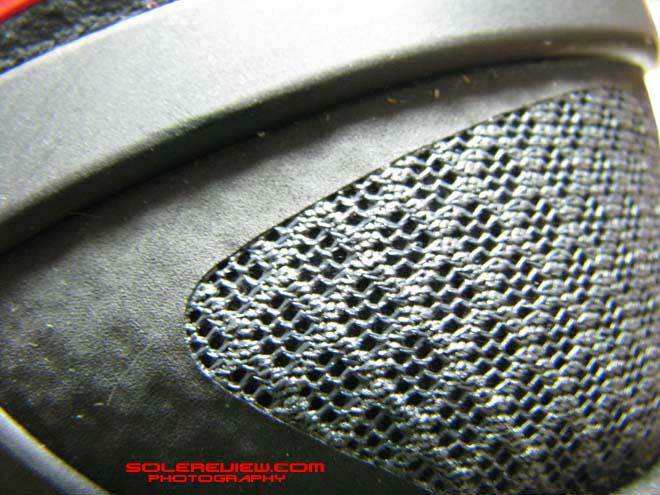 Ridges on the reverse of the Lunarglide 3’s sockliner. This allows the sockliner to wrap around your foot when you tighten the independent midfoot straps. 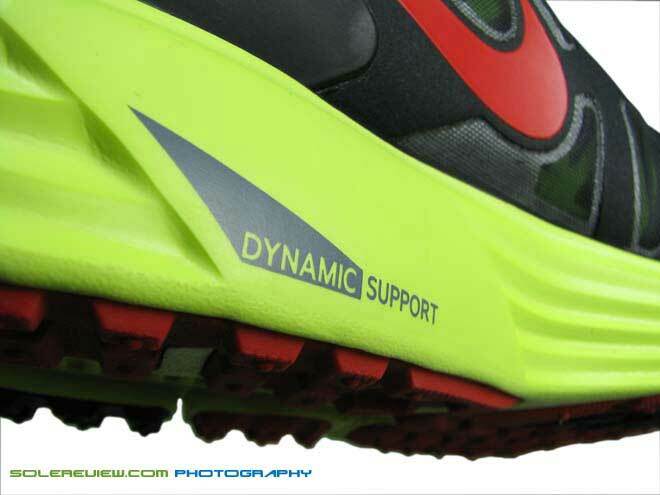 Dynamic support and Lunarlon points to the Lunarglide’s place in the Nike product line – a versatile, do it all shoe. 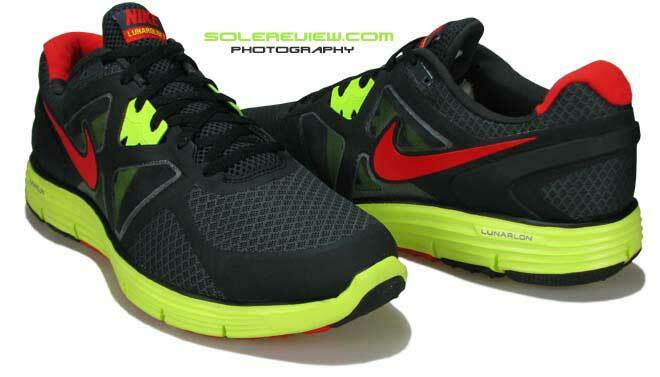 So with all these improvements and changes, how does the new Lunarglide+ 3 perform on the road? After a 4K run, I felt two very clear differences between the original Lunarglide and its latest avatar. The first was the extremely snug midfoot, owing to the independent midfoot strap. Even when you are just tying the shoelaces on, you feel the snugness and the wrap-like fit in the midfoot area. And that becomes even more evident when you are running at medium pace. The foot feels snug and secure, and that is certainly confidence inspiring. The second difference is the cushioning. 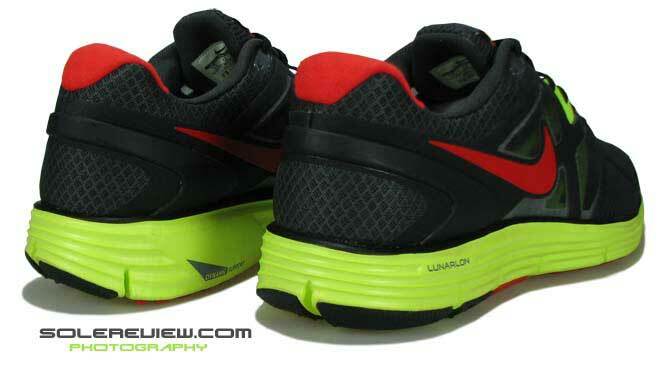 The new Lunarglide 3 feels much more cushioned; and I don’t mean in a plush Vomero sort of a way, but rather springy. With each heel strike, you feel your foot sink in, but only momentarily before it springs back into shape, ready for the next heel strike. Feels like just right for someone who is a tempo runner, but needs a lot of cushioning for road running. 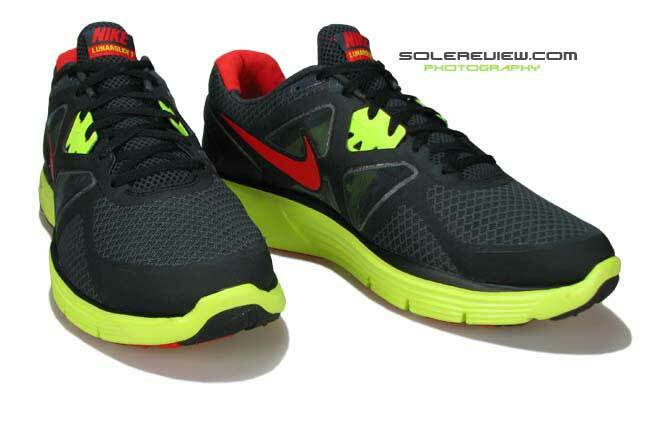 The overall shoe is slightly lighter than the earlier Lunarglide. The 2009 version we reviewed was 324 grams for a half pair of US 10, while this is 324 grams for a half pair of US 11! My guess is that the shoe will be lighter by 8-10 grams or so size for size. 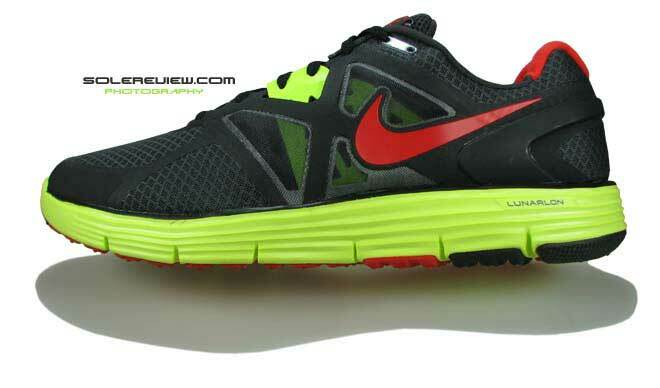 So is the new 2011 Lunarglide 3 a better shoe than the original? The answer is a resounding yes, with the new midfoot clasping system and the improved cushioning being two of the notable improvements. We will be putting more miles on this shoe, and we’ll be back with more updates! Long term update: Two months since the review, and we’ve put many more miles on the Lunarglide 3. Our initial impression of the shoe remains unchanged – it is a good, all around shoe which you can run in everyday or medium distance races, provided you are not looking for speed. One of the negatives we had called out in the mini-review was the absolute lack of reflective bits. Guess what, the Lunarglide 3 Shield version released in October 2011 has enough reflective bits to blind the abominable snowman! 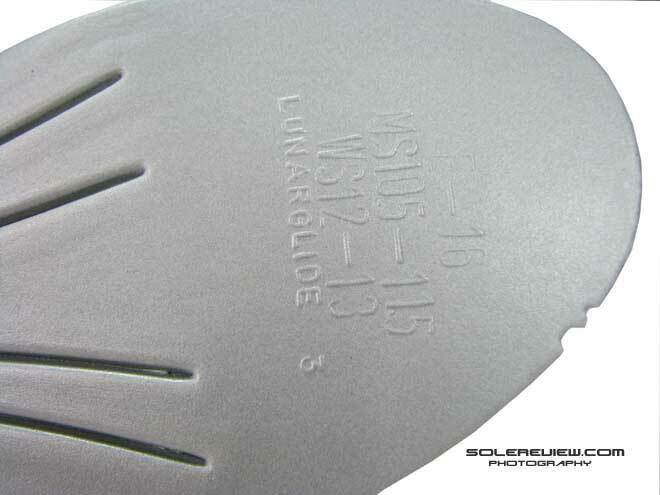 Read our full detailed review of the Lunarglide 3 Shield! 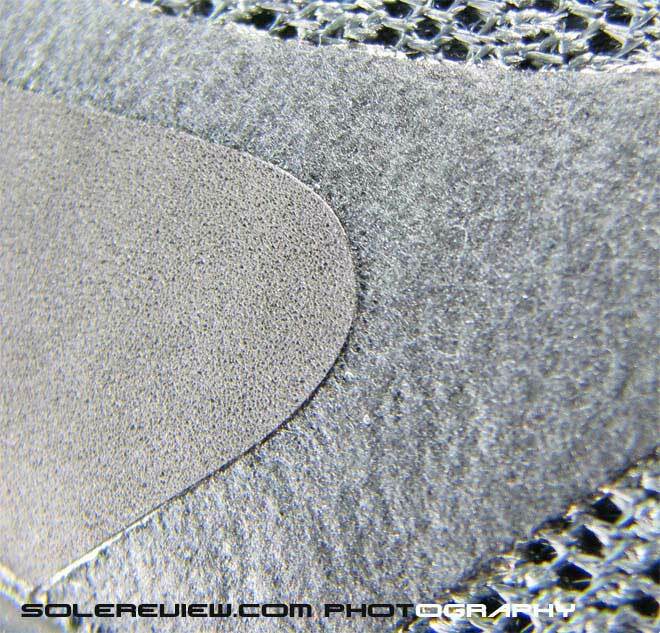 More exclusive pictures of the Nike Lunarglide+ 3 from solereview.com!